This past week I taught a workshop on Memory and Story through the Hennepin County Library and St. Louis Park Senior Program. I announced right away that this was a workshop and we were going to learn by doing–and boy, did we! Seventeen writers, two days, and lots of writing. I participated in the exercises I assigned. When you’ve been working on a few long-term projects for a while, you forget to just practice and it was fun to cut loose and play with new material. The writers ranged from those interested in sharing their memories with their children and grandchildren to those who were working on their memoirs. We were all storytellers. Not all of the writing was “good” as good goes (I can say that because one of my pieces shall never see light of day! ), but it was all good writing, every single word. That is the beauty of freewriting. In freewriting, you let the mind roam and keep the hand moving. Simple. Easy. Surprising! I think I first learned—many years ago—about timed writing exercises in Natalie Goldberg’s Writing Down the Bones. If you aren’t familiar with that book, grab a copy. The short essays provide a glimpse of Natalie’s writing life with lots of inspiration, encouragement, and exercises. I showed my fellow writers Lawrence Sutin’s Postcard Memoir. As memoir goes, the form is unique, engaging, beautiful. I wanted them to see that memoir does not have to plod along a timeline, ticking off life events with each added birthday candle. Sutin’s work is reflective, amusing, and honest. He pairs each short piece of writing with an antique postcard. After reading a couple of Sutin’s pieces, I passed out copies of some vintage postcards from my own collection, including some tattoo flash art from back when you could get inked for under $5, a riverboat scene, and Buffalo Bill Cody in his buckskin coat, among others. In the exercise we did, each writer selects an image as a starting point, then freewrites for 15 minutes. The image might remind you of something. It might inspire a setting or character for some fiction. It might start you ruminating on some facet of life. The fun of this exercise is that you look at an image and start writing the first thing that comes into your mind. You keep writing wherever your thoughts and the words take you. Without a predetermined topic or destination, your writing is free to go anywhere and you just get out of the way and keep your hand moving. In fact, if you get stuck, you write “I am stuck. I am stuck. I am stuck….” until the next thought comes to mind. 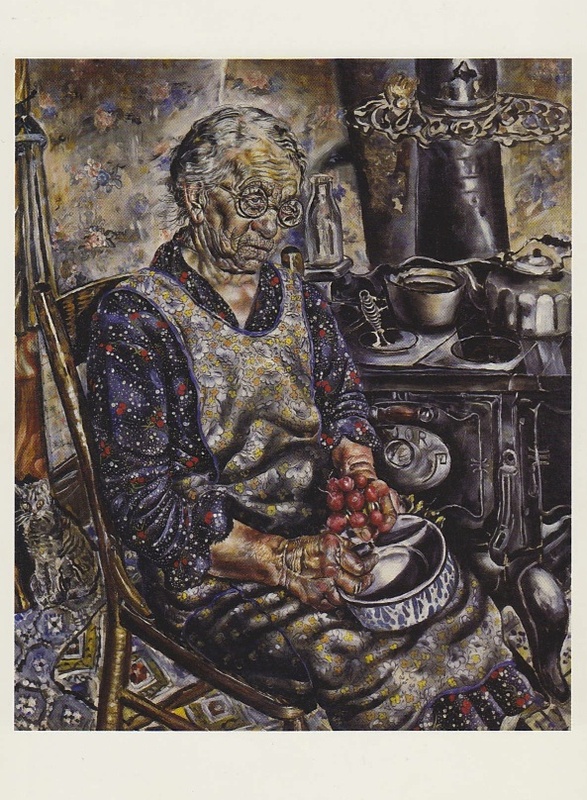 I chose an image of an old farm wife sitting in front of a cast iron stove with a paring knife and bowl on her lap. She might be pitting cherries or trimming radishes—we weren’t sure. I chose it because my grandparents had a wood-burning stove in their home. I thought I was going to write about my grandmother and the antique iron trivets that used to hang on the brick wall behind the stove. My freewriting, however, led me in another direction. Take a peak if you like, it’s below. This is raw, unpolished writing that ends when the time runs out. This is freewriting. We don’t judge freewriting. As for your writing, set a timer for 15 minutes. Get out your notebook and pick up your pencil. Ready? Set? Go! My grandmother’s house, “the cottage,” we called it, sat on Lake Eunice in the Detroit Lakes area of Minnesota. It was really my grandparents’ house, of course, but I was so fond of Gramma and less so of Granpa, that I always thought of it as Gramma’s house—you know the way you do. Eventually this became accurate because she outlived Granpa by quite a few years. I was a freshman in college when Granpa died and a mother of a preschooler when Gramma died. If I’m honest, only one of those departures was difficult for me. Granpa was a crotchety old cuss if ever there was one. He was tall and stoop-shouldered. He shuffled through life as though that bend in his neck made it impossible to take a regular step. He smoked Red Owl cherry tobacco in his pipe, which he kept on the cast iron wood-burning stove in the cottage. I brought it to him once, believing he’d misplaced it. I was expecting something like warmth in return, a “thanks, I was missing that,” or “how fortunate you are clever enough to return objects to their rightful owners.” Instead he said with the gruff voice of a smoker, “I know. Now put that back where you got it from.” I did as I had been told and left him to seek the softer company of the women in the house. Granpa’s ears and nose never stopped growing, not even for a quick nap. I understand that is the way of these cartilaginous appendages, on all of us, not just him. Granpa’s features had become exaggerated to the point that I marveled at their size. Once, when my brother and I got into it and I was uncharacteristically mean, I called him “grandpa-zit-nose,” combining two horrors of adolescence in one insult. It was rather prescient of me, since my brother is five-and-a-half years older than me and I had not yet hit puberty. He winced, which is how I knew even then that I had both achieved my objective and been regrettably unkind. Oh, so interested to hear how the workshops went! I loved that you used Larry Sutin’s Postcard Memoir–and then to have students work with their own postcards. What a great idea! I hope you got some useful feedback and future work out of this experience. Thanks, Wendy! Everyone seemed to enjoy the workshop. I know I’ll have some repeat students in my Time & Place workshop this weekend. Also, in January I’m teaching a workshop on making a story blog and self-publishing ebooks that is a spin off of this class because there was a lot of interest in ways to get their stories out into the world.